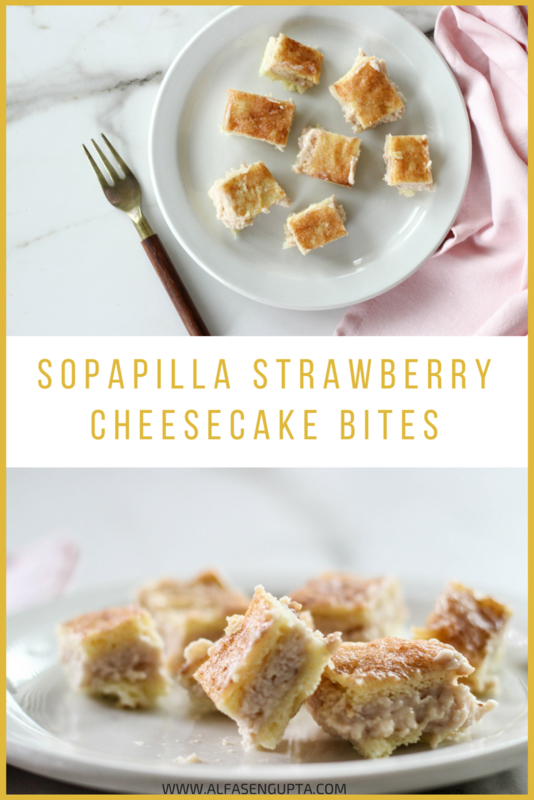 Immaculate Sopapilla Strawberry Cheesecake Bites! Christmas is less than three weeks away, and that normally means we are all in our planning phases! Parties are coming our way, lots of random get togethers with potlucks, and of course the big kahuna, Christmas dinner! I always love planning a good menu for Christmas. I know some people get stressed, but I honestly get giddy. HA. Haven’t finalized everything for ours yet, but luckily I have a bit of time! However, I did get a head start on making some desserts that I want to add to my menu! 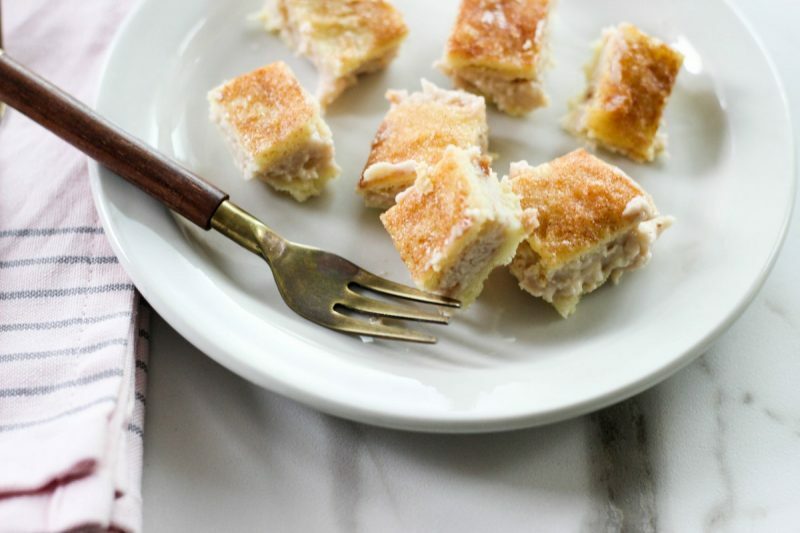 I actually used to make this dessert quite a bit about 5 years ago, but completely forgot about it until I was about to partner with Immaculate Baking and realized that this recipe is perfect to bring back for this season. 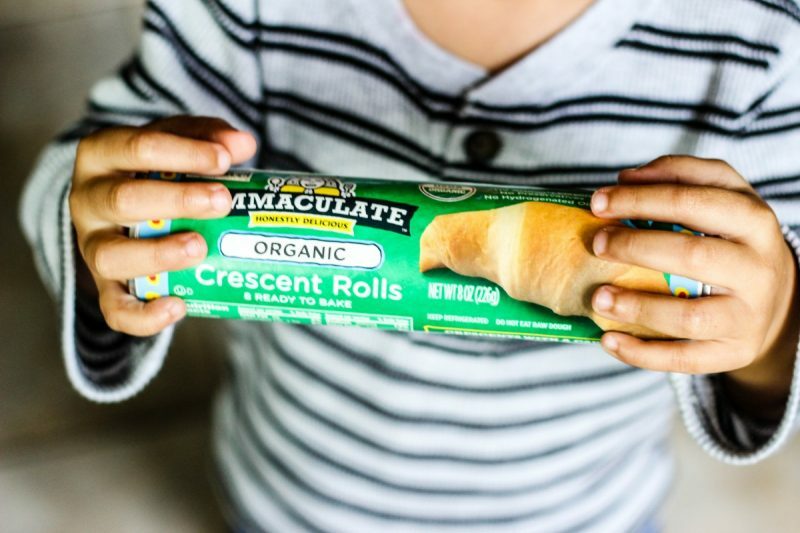 We love Immaculate Baking products because many are certified gluten free or organic! Funny story actually… I won a dessert competition a while back for a company holiday party we were having when I was working at Dell. You guys. I’m not kidding when I say this stuff is GOLD. It’s fast, it’s easy, minimal ingredients, and definitely will not disappoint. You need to make it. Like yesterday. Open up one of the crescent roll packages, and lay it flat into the baking dish. Pinch up all the seams so there aren’t any holes. In a large bowl, mix the cream cheese, the strawberry preserves, the 3/4 cup of sugar, and the vanilla. Once it’s well blended, spread it all across the crescent roll that’s in the dish. Next, open up the second crescent roll package and flatten it out with a rolling pin. I’ve noticed that makes it easier to put on top of the cream cheese spread versus, putting the crescent roll straight on top and trying to pinch the seams closed. Once you have it flat and ready to go, make sure you add it to the top. Now, pour your melted butter all over the top and make sure it covers the entire “cake”. Mix together the 1 tbsp of cinnamon and the 2 tbsp of sugar in a small bowl until well mixed. Sprinkle all over the melted butter. Bake in the oven for 25 minutes. Once it’s done, let it cool in the fridge for at least an hour! I know that’s the challenging part, but you want to wait so you get to cut perfect little squares unlike mine in the pictures. I just couldn’t wait…HA. It smelled toooo good! Share them with basically everyone if you have any leftovers! Spray a 9x13 baking dish with cooking spray. 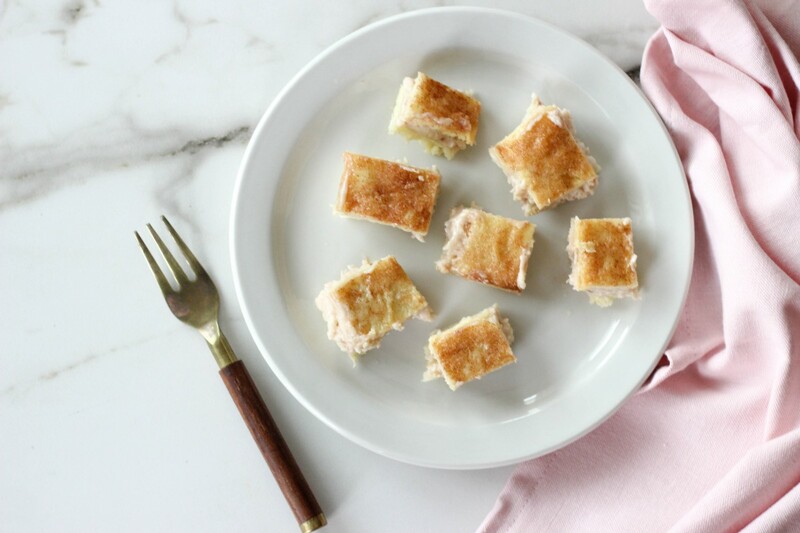 Open up one of the crescent roll packages, and lay it flat into the baking dish. Pinch up all the seams so there aren't any holes. In a large bowl, mix the cream cheese, the strawberry preserves, the 3/4 cup of sugar, and the vanilla. Once it's well blended, spread it all across the crescent roll that's in the dish. Next, open up the second crescent roll package and flatten it out with a rolling pin. I've noticed that makes it easier to put on top of the cream cheese spread versus, putting the crescent roll straight on top and trying to pinch the seams closed. Once you have it flat and ready to go, make sure you add it to the top. Now, pour your melted butter all over the top and make sure it covers the entire "cake". Bake in the oven for 25 minutes. Once it's done, let it cool in the fridge for at least an hour so it's easier to cut into squares! Pin it so you can reference this again! 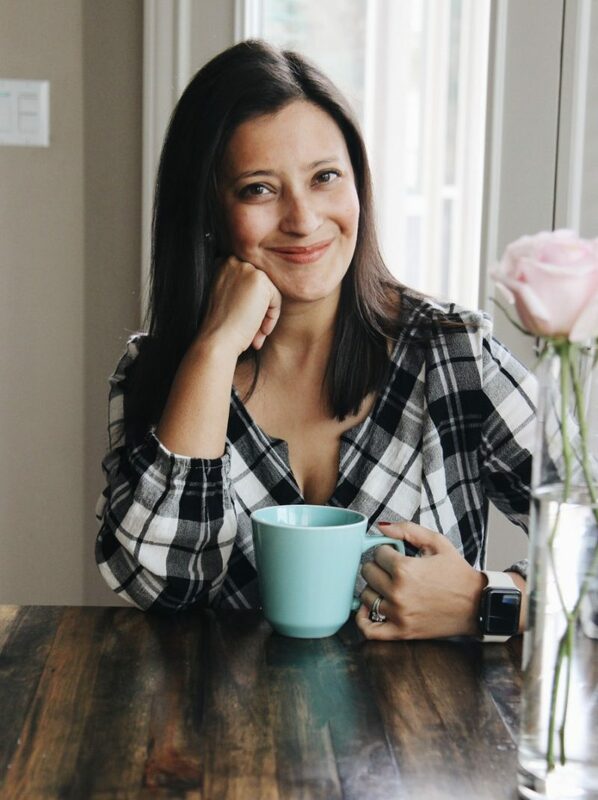 Previous Post Dressing for Fall in Texas Weather! Yum! That looks really good! I’m trying this one weekend! 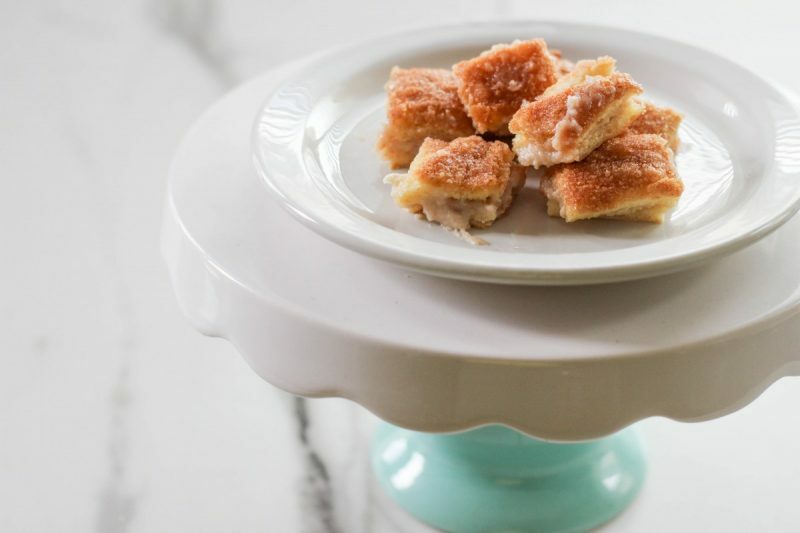 I have a sweet tooth and this recipe looks too good to not try. 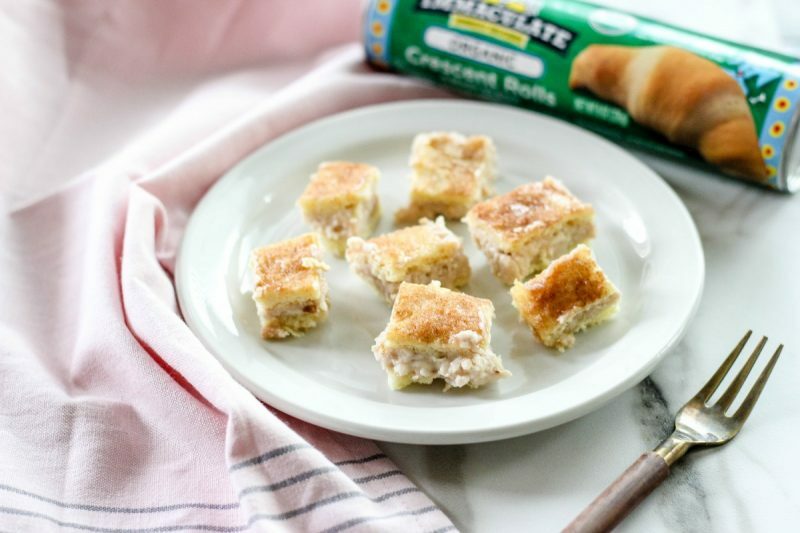 So I am heading over to the store today as I can try these cheesecake bites over the weekend. Yummy! These would be such a hit at a holiday party! Oh my gosh, absolutely!! These are always a hit anywhere I take them! I LOVE strawberry cheesecake so these sound right up my alley! They sound amazing! These look SO good! And it looks pretty doable too! Pinning to make for my family. My little boys will LOVE it! These sound so good, and what a great dessert! So easy and delicious! Yes, they are so easy!! Definitely give them a try! I need to get me some crescent rolls, amazing how you can make anything out of them. These look really yummy. Crescent rolls really are my best friend! So versatile for literally anything and everything! these look so tasty and easy to make! thanks for sharing! If it has cheesecake in it, then sign me up! Have to see if I can find the time to put this together this weekend- looks delicious! Right?! Cheesecake it life!!!!! HA. Yummy!! I want to give these a try! Thanks for sharing, Alfa!! Now this is a delicious combo!! Never thought of a recipe like this before. Can’t wait to try them! Oh my goodness, these look so good! I definitely pinned for the future!